"A compelling agricultural story skillfully told; environmentalists will eat it up." "In the age of start-ups and tech crazes, it might seem counterintuitive to call something as ancient as grain 'revelatory.' Nevertheless, Bob Quinn's quest to recapture the value of our food system through grain is just that—a revelation. Liz Carlisle and Bob Quinn have unlocked the key to kickstarting change—Grain by Grain is one big kernel of truth." Daphne Miller, MD, author of "Farmacology: Total Health from the Soil Up"
"Long before anybody heard the term social enterprise, a few untrained businesspeople started small, unconventional companies to solve problems for their neighbors—and succeeded beyond their wildest dreams. This is the story of one such entrepreneurial effort, which demonstrates how a green economy rooted in regenerative organic agriculture and renewable energy can help rebuild struggling communities in rural America." David R. Montgomery, author of "Growing a Revolution: Bringing Our Soil Back to Life"
Join Berkeley alum and Lentil Underground author Liz Carlisle and organic farmer Bob Quinn for a launch of their new book, Grain by Grain. When Bob Quinn was a kid, a stranger at a county fair gave him a few kernels of an unusual grain. Little did he know, that grain would change his life. Years later, after finishing a PhD in plant biochemistry and returning to his family’s farm in Montana, Bob started experimenting with organic wheat. He learned that the grain he first tasted at the fair was actually a type of ancient wheat, kamut, and he went on to found a multimillion dollar heirloom grain company, Kamut International. Hear Bob Quinn’s compelling story, and how his regenerative agriculture practices can serve as a model for growing a healthy future, grain by grain. Sponsored by the Center for Diversified Farming Systems. Cosponsored by the Berkeley Food Institute, Graduate School of Journalism, and ReGrained..
Come celebrate the release of Big Sandy resident and organic farmer Bob Quinn's first book, Grain by Grain. Bob’s compelling story, and his regenerative agriculture practices, can serve as a model for growing a healthy future, grain by grain. But as demand for organics grew, so too did Bob’s experiments. He discovered that through time-tested practices like cover cropping and crop rotation, he could produce successful yields — without pesticides. Regenerative organic farming allowed him to grow fruits and vegetables in cold, dry Montana, providing a source of local produce to families in his hometown. He even started producing his own renewable energy. And he learned that the grain he first tasted at the fair was actually a type of ancient wheat, one that was proven to lower inflammation rather than worsening it, as modern wheat does. When Bob Quinn was a kid, a stranger at a county fair gave him a few kernels of an unusual grain. Years later, it would become the centerpiece of his multi-million dollar heirloom grain company, Kamut International. How Bob went from being a true believer in better farming through chemistry to a leading proponent of organics is the unlikely story of Grain by Grain. Along the way, readers will learn how ancient wheat can lower inflammation, how regenerative agriculture can bring back rural jobs, and how combining time-tested farming practices with modern science can point the way for the future of food. 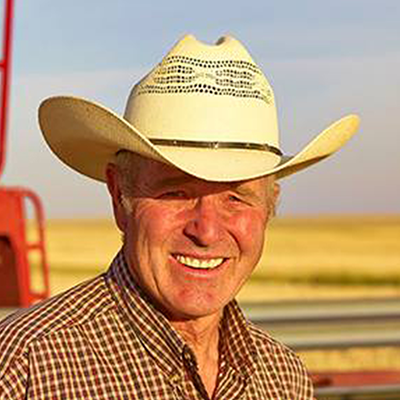 Bob Quinn is an organic farmer near Big Sandy, Montana, and a leading green businessman. He served on the first National Organic Standards Board, and has been recognized with the Montana Organic Association Lifetime of Service Award, The Organic Trade Association Organic Leadership Award, and Rodale Institute's Organic Pioneer Award. His enterprises include the ancient grain business Kamut International and Montana's first wind farm. In Grain by Grain: A Quest to Revive Ancient Wheat, Rural Jobs, and Healthy Food you’ll hear the story of this straight-shooting “green economy cowboy” in his own words—following Bob from the farm fields of Montana to Italian university research labs where he discovered the health benefits of ancient wheat. With his co-author Liz Carlisle, author of the award-winning Lentil Underground, Bob shares the practical wisdom he has learned from a lifetime of farming, from the day he stopped trying to grow food “on the cheap,” to his work creating renewable energy in Montana on his farm. Please join authors Bob Quinn and Liz Carlisle for a discussion about the book and to recieve a signed copy. Join organic farmer Bob Quinn and Stanford Lecturer Liz Carlisle for highlights from their new book, Grain by Grain. Drawing on Bob’s 30-year journey in regenerative organic agriculture and renewable energy, they will discuss how transformation of regional food systems can drive big changes over time: creating good green jobs that rebuild rural communities, while providing healthier food and better environmental stewardship. Along the way, they’ll shed some light on the recent epidemic of gluten sensitivity, and offer some suggestions for how to restore a healthy relationship with wheat. Join us for our inaugural event in the Good Earth Classroom! 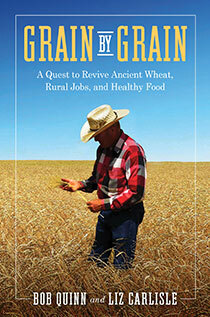 Bob Quinn and Liz Carlisle are stopping by to discuss their new book Grain by Grain: A Quest to Revive Ancient Wheat, Rural Jobs, and Healthy Food. Light, organic refreshments will be served, courtesy of Good Earth Natural Foods. Join Bob and Liz for the book launch event for Grain by Grain. Bob’s compelling story, and his regenerative agriculture practices, can serve as a model for growing a healthy future, grain by grain. Join us for a book launch party in celebration of Bob Quinn and Liz Carlisle’s new book Grain by Grain: A Quest to Revive Ancient Wheat, Rural Jobs, and Healthy Food. Bob and Liz will speak and sign books, and we’ll have ancient grain goodies on hand for tasting. Kirkus Reviews called it "A compelling agricultural story skillfully told; environmentalists will eat it up." In Grain by Grain: A Quest to Revive Ancient Wheat, Rural Jobs, and Healthy Food you’ll hear the story of a straight-shooting “green economy cowboy” in his own words—following Bob Quinn from the farm fields of Montana to Italian university research labs where he discovered the health benefits of ancient wheat. With his co-author Liz Carlisle, author of the award-winning Lentil Underground, Bob shares the practical wisdom he has learned from a lifetime of farming, from the day he stopped trying to grow food “on the cheap,” to his work creating renewable energy in Montana on his farm. We sat down with Bob and Liz to speak about rural economies, organic food, success, and what it will take for a large-scale transition to organic farming in the US. Read that conversation, and share your questions in the comments, below. Liz, in the prologue you refer to Bob as a “green economy cowboy” and a “genuine American hero.” What do you mean by that? Do you see any parallels between Bob’s story and the renegade farmers you wrote about in Lentil Underground? What I found so compelling about Bob Quinn’s story—much like the Lentil Underground story—is that here is a model for how to make a living in a way that is regenerative rather than extractive. Bob started this journey on his own farm, when he transitioned to organic practices and started feeding the soil rather than mining it for nutrients. Then, and this is what is so fascinating to me, he took that same principle of regeneration and extended it to an entire regional economy—from value-added organic food businesses to a wind farm. I call him a “genuine American hero,” because I see no more critical work to be done right now in this country than to reorient our economies in this fashion, so that they regenerate our communities, our health, and our planet as they provide good jobs. Food is an important place to start, because it’s at the center of how every single one of us interfaces both economically and ecologically with the world around us. You write that this book is about “adding value back where it belongs, not only to the end product—our food—but to the entire food system.” What does this mean? What does it look like in practice? Looking at the food choices that most people in this country have these days, we see an awful lot of cheap food. And we see a very high cost to that cheap food—the human suffering and economic burden of chronic disease, the human health risks and environmental burdens connected to agricultural chemicals and vast feedlots, and the struggles that so many farmers and food workers are facing just to earn a decent living in this cheap food economy. On the flipside, we see that food and agriculture have the potential to provide so much value to our society, when we stop trying to make things cheap and focus more on value and quality that benefits everyone. Regenerative organic agriculture can promote healthy soil, clean water, and reduced greenhouse gas emissions, while providing a healthy diverse diet and good green jobs. Bob has gotten a taste of this kind of food system on his farm and in his organic food businesses, and we want to encourage people that this kind of win-win-win is both necessary and possible. Organics only make up a small portion of farming by total land. In your opinion, why aren’t more farmers transitioning to organic? What policies or changes are needed to help the US make the transition on a larger scale? Chemical agriculture is doubly subsidized. On the one hand, chemically dependent monocultures of crops like corn and soy and wheat are still heavily subsidized by federal farm programs—and they benefit from historical subsidies too, including decades of publicly funded research and development. But there’s another, invisible subsidy. Chemical agriculture has a massive cost to our society, but agricultural chemical companies aren’t currently forced to pay that cost. We saw this dynamic play out very clearly in the Des Moines Water Works case over nitrogen pollution in the Iowa water supply. It’s still the taxpayer who’s on the hook to clean up this pollution, rather than the people causing it. Were we to even this playing field and start paying the true cost of our agriculture (IE: if chemical companies were taxed to pay for the cleanup of contamination and seed owners were taxed to pay for the health costs of their defective seeds), organic would come out a clear winner. As would the earth and the rest of us. So, why are more farmers not transitioning? One of the main reasons is fear—fear of the unknown, fear of failure, of not being able to control weeds, of not knowing how to market organic crops or incorporate soil building methods into their system successfully. And many would-be organic farmers are concerned what about their neighbors will say. Whatever their reason, any farmer interested in transitioning to organic has the same need for information— and answers for how to make it work. This is where a robust organic extension program and an increase in research dollars spent for organic research are needed. Why not require USDA organic research funding to mirror the percent of market demand for organic food (currently about five percent)? This simple change would increase funding for organic production by nearly four or five times and reduce funding for chemical production by a mere 4 percent. What does this organic transition mean for improving the economy and jobs long term? Edward Jaenicke, an agricultural economist from Pennsylvania State University, recently conducted a study on this question. He identified 225 counties in the US that had high levels of organic agriculture and were also neighbored by counties with high levels of organic agriculture. He called these “organic hotspots.” When Jaenicke looked at county-level economic indicators for these hotspots he found that being an organic hotspot increased median household income by over $2,000 and lowered county poverty rates by as much as 1.35 percent. It’s the same impact Bob saw when he transitioned to organic wheat. While organic production takes more work and management, it also means more jobs contributing to the rural economy. Bob can make two, sometimes three times as much as he would with commodity conventional wheat. And he knows the customer is getting a higher value out of that product—organic food is higher in antioxidants, and of course it reduces the flow of toxins into our environment. In recent years, wheat has gotten a bad rap, with more and more people complaining of gluten sensitivity. Why do you think that has happened and how can ancient grains help fix the problem? The wheat products we eat in the US today are so different from what our great grandparents ate, it’s remarkable we still call this stuff by the same name. First of all, we farm the wheat with chemicals, and we’re still learning about how those might be impacting our bodies. For example, research coming out of Canada suggests contamination of glyphosate on wheat is creating nearly the same symptoms as people experience with non-celiac wheat sensitivities. Secondly, we process the wheat in ways that dramatically change its composition and absorption in our digestive system. Not only do we shave off the bran and the germ to make white flour, we also use quick rising yeasts instead of sourdough when we bake, so we don’t have the benefit of bacteria and wild yeast to predigest compounds like gluten. And finally, the wheat varieties we eat these days have been bred for yield and loaf volume, with little to no attention paid to what is happening to digestibility and nutrition in the process. In the medical studies Bob has been involved in, subjects who ate organically farmed, whole ancient wheat—varieties that precede all the aggressive breeding for yield and loaf volume—saw dramatic differences in their health after just a few weeks. When compared to organically grown modern wheat, ancient wheat produced lower cholesterol, lower blood sugar, fewer digestive issues, and significantly less inflammation in their body, which seems to be the key to everything else Bob and his colleagues saw in those studies. Bob, how did your transition to organics inform your experiments with biofuels and creating Montana’s first wind farm? What is the connection between organic farming and renewable energy? I see my transition to organic ag and to wind power and biofuels as pieces to the same puzzle: how can we live in a sustainable, regenerative way that is not extractive or polluting? When you ask this question, to me there is no difference between organic regenerative agriculture and renewable energy. They are applying the same underlying principles to two different systems. Farming communities like Big Sandy, MT often suffer from a lack of fresh, healthy food. What is at the heart of this paradox? What lessons from Grain by Grain can lead to a better way forward? In Big Sandy and most other rural American communities, we are not suffering from a lack of fresh food (we are supplied from the same large trucks that supply food stores in larger towns). However, our choices are limited. What we do suffer from—along with most of the rest of the country—is a lack of food grown without chemicals and pesticides on soil that is healthy and resilient. Even a great deal of what is in the organic section is not as nutritious as it could be, if, for example the baked goods were made from ancient and heirloom grains, or the meat, eggs, and milk came from free ranging, grass-fed animals. The paradox of food in this country is similar to someone sitting in a lifeboat at sea, dying of thirst while surrounded by water unfit to drink. We live in a country of abundant food. Generally, we are very well fed. But that is not the same as being very well nourished. People in farm communities like Big Sandy aren’t paid to grow food for themselves. Farmers in our rural communities get paid to grow commodities for processing and export. We need to change that and start developing regional food systems in which enough farmers are encouraged to grow healthy food on healthy soils to feed their neighbors and local communities, and to embrace foods that are adapted to their unique place. Bob has started doing that with cold-tolerant fruit trees and dry farmed vegetables—fresh, nutrient dense produce that is well-suited to an arid environment with cold winters. But it’s not just farmers. Eaters have a big role to play here—we can all support farmers who are growing locally adapted food in an ecological manner, and start shifting our diets toward seasonal produce. As we write about in Grain by Grain, this embrace of seasonal food isn’t a sacrifice—it’s a chance to get more connected to the places we live and savor the gifts of the land. Bob, the story of your success is rife with partnerships—with farmers, neighbors, a university, and even partnering with Liz to write this book. How do partnerships fit into your philosophy on food? I have always believed that successful businesses, projects, organizations, and governments are best served by a team made up of diverse, cooperating individuals who each contribute their own gifts and talents and are willing to work for the good of all rather than the just the advancement of self. No one person has all the best ideas or abilities, which is why a team effort is so much better than a single player. I see the food system in a similar light. Did you learn anything in the course of writing this book together that surprised you? We agree about so many things! This book was a leap of faith for both of us, since we come from different social and political communities. We knew we could have a productive conversation, but could we actually agree about several hundred pages of text that would bear both of our names? As it turns out, talking through word choices and phrasing opened up so many enlightening conversations about how we each see the world, and the experiences that led us to this point. I think we found a lot more empathy for each other in the process, along with a powerful common agenda that we believe many people in this country could unify around, to our mutual benefit. What do you hope people take away from this book? In general, our goal for the book was to engender hope for the future and a better understanding of the consequences of our current food system and what we can do to begin to change it for the better. We hope people will be inspired to try new ideas and dreams without being discouraged by the naysayers. We wanted a book that would also be fun to read and a fresh alternative to so many negative themes, name-calling and divisiveness, which seems to be dominating our culture today. Specifically, we hope people come away from this book feeling energized to come together and take control of their health, their communities, and their environment. Changing the way we grow, purchase, and eat food is a huge first step that could set so many other pieces of this transformation in motion—and it’s something every single one of us can do. In the process, we’ll need to reach across some of the divides that polarize us, and we hope our example will encourage folks that this is not only possible, but potentially a deeply enriching experience! In Grain by Grain: A Quest to Revive Ancient Wheat, Rural Jobs, and Healthy Food you’ll hear the story of the straight-shooting “green economy cowboy” in his own words—following Bob Quinn from the farm fields of Montana to Italian university research labs where he discovered the health benefits of ancient wheat. With his co-author Liz Carlisle, author of the award-winning Lentil Underground, Bob shares the practical wisdom he has learned from a lifetime of farming, from the day he stopped trying to grow food “on the cheap,” to his work creating renewable energy in Montana on his farm. Ultimately, Bob’s forays with organics turned into a multimillion dollar heirloom grain company, Kamut International. He discovered that through time-tested practices like cover cropping and crop rotation, he could produce high quality and successful yields—without pesticides. Regenerative organic farming allowed him to grow fruits and vegetables in cold, dry Montana, providing a source of local produce to families in his hometown. He even started producing his own renewable fuel. And he learned that the giant grain he first saw at the fair was actually a type of ancient wheat, one that could be the answer to gluten sensitivity. In a time of divisive politics and entrenched viewpoints, Bob’s story proves that what we have in common is more powerful than what sets us apart. He shows that red America can be leaders in sustainability; that organic farming can revive rural jobs; and that together we can chart a healthier agricultural future. By following his example, we can write a new story of American agriculture, grain by grain. Check out the Introduction “Food on the Cheap” below, or download the PDF here.